WAHOO for fresh juice!!!! this is my favourite staple juice blend. 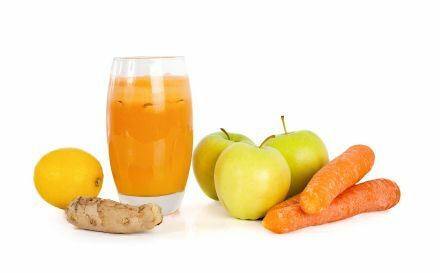 Buy a big bag of carrots, a couple bags of apples a couple of cucumbers and some fresh ginger, turn on the juicer and BINGO...Juice for the WEEK!!! WAHOO for fresh juice!!!! this is my favourite staple juice blend. Buy a big bag of carrots, a couple bags of apples a couple of cucumbers and some fresh ginger, turn on the juicer and BINGO...Juice for the WEEK!!! chop up apples into 1/4s and remove core. wash and soak carrots (soaking them helps get out a bit more juice. chop ginger root into 1/2 chunks (it juices better that way). cut cucumber into 3 or 4 pieces. This recipe makes 4 Cups (8 - 1/2C servings) and should be drunk within 3 days! Recipe submitted by SparkPeople user WILDFIREWENCH.